Wow, it's been a long time since I've sewing. This has been our busy season with work. Throw on a couple of grad school finals and sewing has been practically non-existant. Fortunately, I managed to squeeze in a little sewing time here and there over the past month to throw together this simple baby quilt for my cousin who's expecting her first baby late this summer. This was the second tumbler quilt that I made. Both went together very easy. I used my Accuquilt Go! to cut the fabric. I used four charm packs for this quilt that I had lying around for a while now. I'm determined to use some of the fabric I have in my stash, so I'm hoping to use fabric I have on hand for the backing and the binding. My goal is to have this quilted and bound within the next month. I think it's do-able, but you never know. I know its definitely has been a while! Such a lovely quilt. I love these color combinations. You can totally get it done (if you don't do the binding that follows the edge of the tumblers and has a million angles.) lol. But seriously, you can do it! It's really cute, by the way. 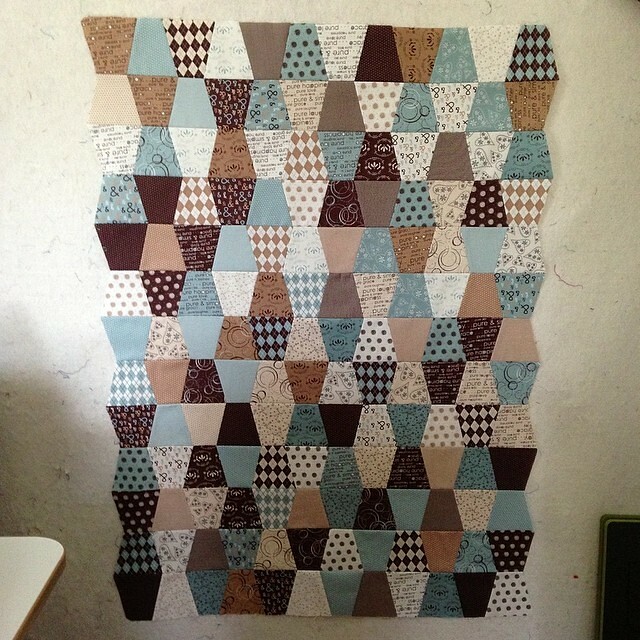 Do you get a lot of use out of your Accuquilt? I'm trying to decide if I can justify shelf space and budget for something I might not use that much.